Selectively reload Autodesk® Revit® families into Autodesk Revit project. 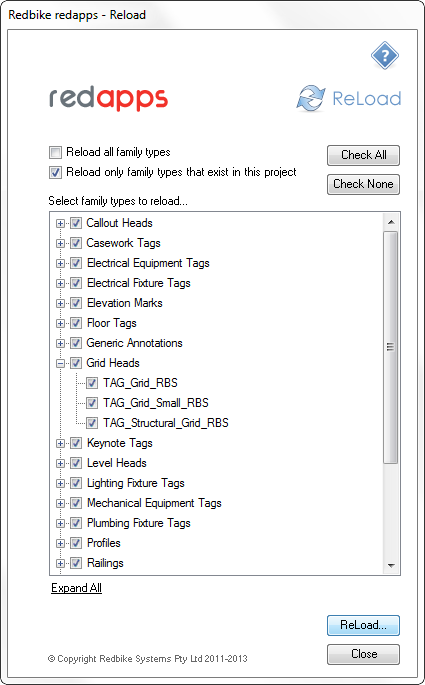 ReLoad displays a categorized list of all Autodesk® Revit® families in the project and all are checked for reload by default. + expand the category to select individual families. ReLoad searches for selected families in the Options/File Locations/Places directory list. If a family is not found, you will be prompted to manually select its location. The RDBK_ReLoad add-in may be purchased on the Autodesk Exchange Apps website for USD 2.00.